Welcome New Tall Mom Bloggy Pack Members!!! 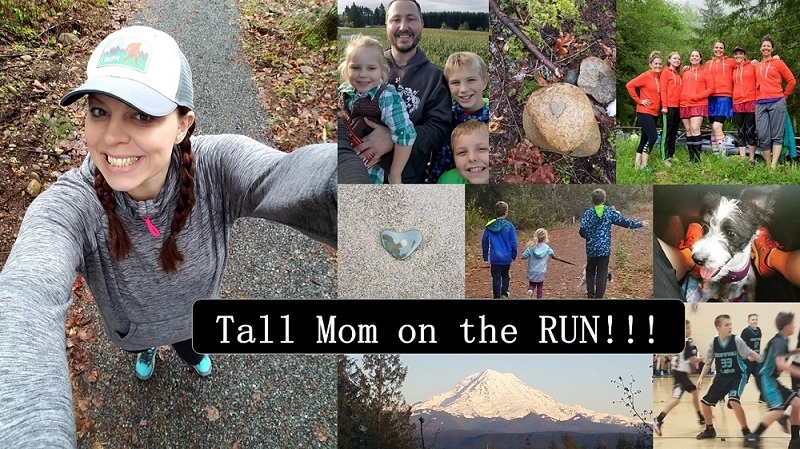 Yesterday was my LAST run of Marathon training, next up my 26.2 Victory Lap :) Muscle Man joined me for the first 3ish miles, we adventured through the beauty and hills of Bonney Lake. Along the route Muscle Man spotted a Batman figurine, Little Stud #1 loves Batman so he grabbed it. for the next mile we chuckled about what people thought of a grown man carrying a Batman figure while he ran. I dared him to pretend to make Batman fly....he wouldn't. I dropped him off and took the scenic route along Lake Tapps...I LOVE LOVE that route. I felt like I could run all day, legs feel great and rested.. A small twinge of knee pain, but I am sure it is because I was really focused on it. 6 miles done!!! I will have a FULL post tomorrow about Eugene, reflections, thoughts, ideas, etc.. I know many of you depart Bloggy land on Saturdays. So if you want to track me go HERE and enter #797. And ALL My Fleet Feet Training Buddies!! **I am sure I have forgotten a few people, but I NEED to get away from the computer now. If you would like a High Five Leave a COMMENT. I will not be able to add Links today as we will be travelling to Vancouver part-way on the Journey to Eugene!!! Holy CRAZINESS!! The Tall Mom household has been turned upside down and we are officially HOMELESS :) Let me explain with 3 things..
Our current home closed and to be NICE to the buyers we moved out under the 2 days we had contracted. Yesterday was spent packing, moving, stuffing, organizing, cleaning, packing, cleaning, packing, cleaning, you get the idea. Special thanks to Muscle Man, Uncle Marky and Tall Grandpa and Grandma. Although I was on my feet ALL DAY I did not lift anything or really help load the truck. Around 6:30PM Muscle Man and I said a collective goodbye to our First Home. On my way to my parents house I heard the song "The House that Built Me," by Miranda Lambert HERE this song hit the radio at the perfect time. Yes I am a BIG SAP!! I shed a tear as we pulled away. We got GREAT news that our paperwork for our New House has been approved and we should be signing today or tomorrow and closing Monday or Tuesday. YIPPEE moving into a new house with stairs just days after a Marathon :) LOL such funny timing, but everything happens for a reason. 2 3's is 33.... and you know how I love 33.. it is bound to be LUCKY..
Have I mentioned that I am EXCITED for this Marathon? I remember how I felt the week before my First Marathon. I was a NERVOUS wreck, all I could think about was the race and whether I would finish. This week I am sleeping like a rock and all I can think about is FINISHING with a huge dimpled smile on my face. I have played the finish over and over in my head, all with the same positive result. I APPRECIATE all the positive comment and words of encouragement. I plan to read these comments over and over in the nights to come. 3 Days to Marathon Redemption. A few SHORT days to Marathon #2.. YIPPERS!!! 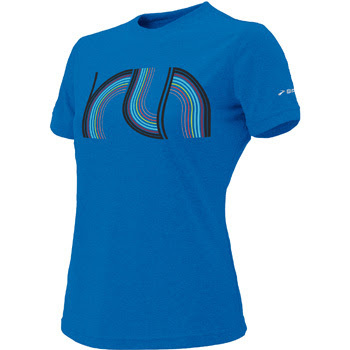 Race Day is coming...I have been in TEST mode to find the perfect race day outfit. What defines the perfect Marathon Race Day outfit to Tall Mom? 1. Comfort= The clothing should fit tight to avoid chaffing. I should not have to pull the pants up or the shirt down at any point during the race. 2. Ready for any weather= The clothing should help me to stay warm if needed but also keep me cool. Being too cold or overheating could be a race disaster. 4. Itch Free= I am an itchy girl, presumably from being so sweaty and having the sweat dry. My clothes should help alleviate the itching as much as possible. 5. Easy to Spot= At 6'0 I am pretty easy to find in a crowd, but to help out Muscle Man and any other AWESOME spectators, I like to have bright colors. And bright colors and prints are FUN!! WHAT WILL I WEAR in Eugene?? You get a vote, below are my options. Leave a comment to vote and you will be entered to win a PRIZE. The only thing I know for sure is I will wear the grey Brooks EZ Run T (Buy HERE). Bondiband, Brooks EZ T, Moeben butterfly sleeves, and Nike Capris. 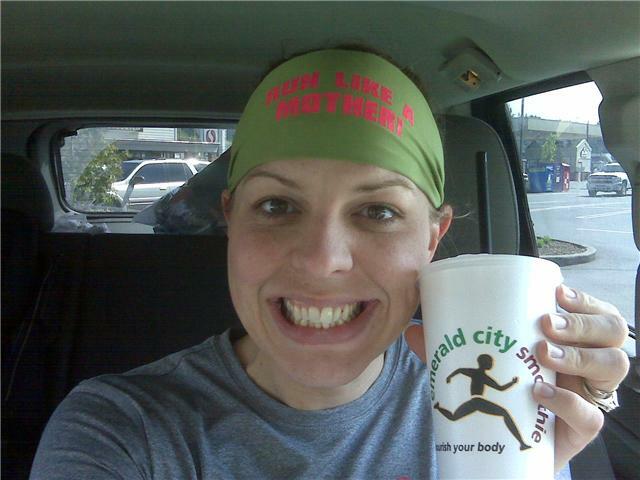 26.2 Bondiband, Brooks EZ Run T, Green-Layer arm Sleeves, and Nike Capris. Run Like a Mother Hat, Brooks EZ Run T, Smartwool arm sleeves and Nike Capris. New Balance Cure Hat, Brooks EZ Run T, Moeben Pink Sleeves and Running Skirts Capri skirt. 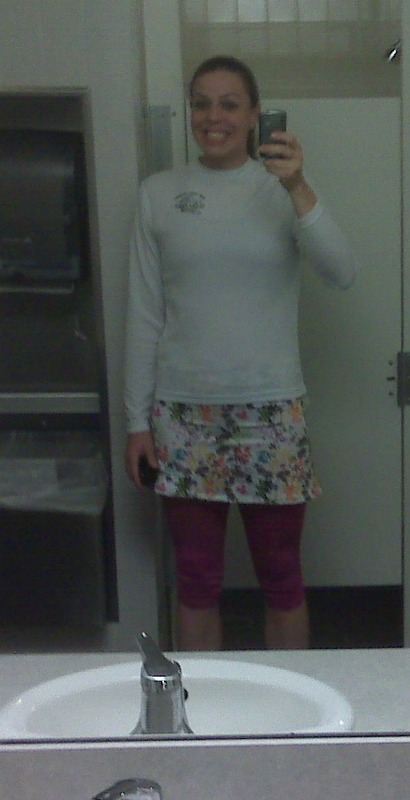 Brooks hat, Brooks EZ Run T, Smartwool sleeves, and Running Skirt Capri skirt. So many FUN options for race day. Pink Balega socks are a MUST. I LOVE LOVE my NEVER BACK DOWN bracelet from Gone For a Run. Don't forget to Enter the Gone For a Run Giveaway HERE. Some extra in my race back just in case..
And the post race recovery outfit. My last day at work today then off to Move and get to Eugene. What race gear can you not RUN without? With training for Marathon #2 coming to a close I am getting a little SAPPY, so bear with me here. Our last Fleet Feet group run on Saturday was fun. The first 2.76 miles were as a BIG group. I spent most of the time talking to Paul, the owner, about his 3 hour Boston effort. We talked about marathon pacing, race strategy and he told me he thought about me as he ran Boston because he wore arm sleeves :) That made my day in a funny way. When we were done with the run we gathered to learn more about race prep, I will pass on some of the good tips later this week. Then Janna and I hit the WET pavement for a few more miles. We ran in the rain from the store, to my soon-to-be new house, to Janna's house. It was raining and the route was not safe, but we got in 9.3 miles, last long run DONE.. Thanks Janna!! It is no secret that I am 333% head over running shoes in love with Muscle Man. Since the moment we met we have been inseparable. We are a TEAM!! 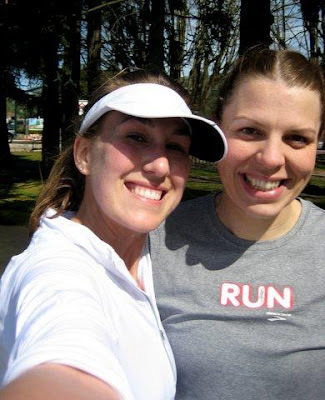 Although when it comes to running, and training for a Marathon, the partnership is a little lop-sided. Every Saturday morning I give him a kiss as I head out for most of the morning. Long Runs, Races, etc... countless hours spent away from my husband. I TRULY BELIEVE that my running and weight loss success are a direct result of the support I have from my husband. And I PRAY that I have held up to my end as a wife. Funny the baby weight from Little Stud #2 was what sparked my running. Between working full-time, running at lunch and being ZAPPED of energy at the end of the day, I often feel like I come up short as a Mom. I try to remember that I am providing for my family, making it possible for Muscle Man to stay home and raise our boys. Working Mother to support a Stay at Home Dad, it is a bit of a role reversal but I KNOW that we are making the right choice. Yes there is guilt every Saturday morning when I leave to run, precious family time is lost. My FAVORITE finish line is when I walk through the front door to the dimpled grins of our blue-eyed babies. How long have I been a runner? Hmmmm good question? I would say that I became a Runner the day I could not remember my life without it. When I started this journey I had to FORCE myself to run and dread it. IT HURT!! Today if I don't get my run in I am a crazy mess. Running keeps me balanced and healthy, it is an outlet for stress, a way to meet new people and a great way to test my limits. I don't need to run Marathons to be a runner. I don't have to be fast to be a runner. I don't need to compete in races to be a runner. All I have to do is lace up my sneakers and bond with the pavement. 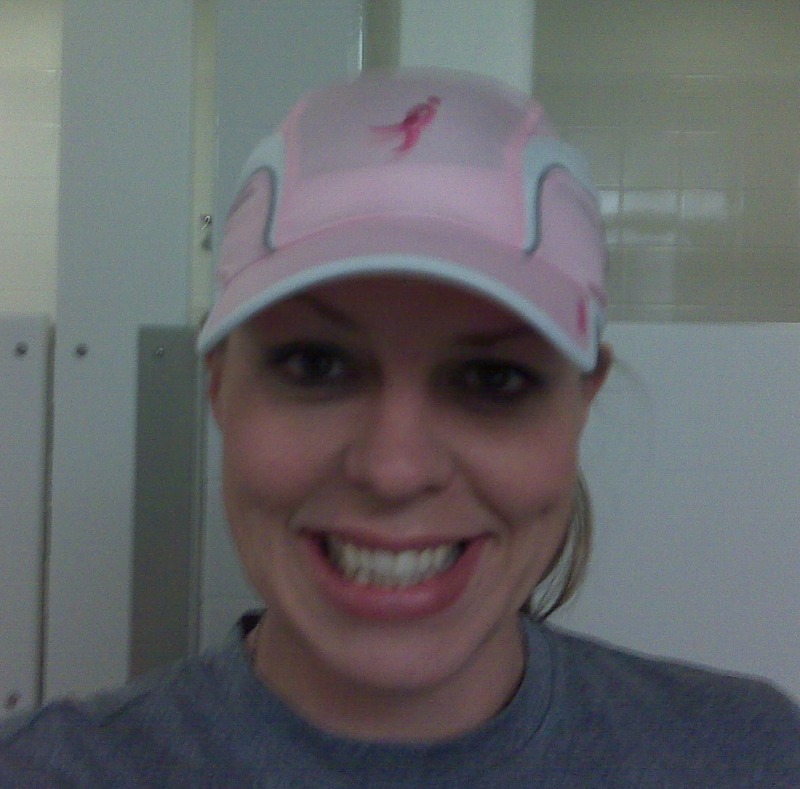 In some ways running is the easiest hat (visor/bondiband) I wear. Thanks to The Silver Maple for this amazing necklace and reminder of the TRULY important things in life. I strive to find a balance of these 3 aspects of ME every day. If you had to pick 3 things to define you what would they be? How do the 3 interact? As a former basketball player there are a few elements in running/racing that baffle me. 1. Run slower in training than you will run in the race. Many folks smarter than me have TRIED to explain this to my little Tall Mom athletic mind.. less risk of injury, more time on your feet, the endorphins in the race will make you faster...etc. Still does not connect. My whole life the words "Game Speed," have echoed in my head. Practice like you are going to play.. And yet in running, that is not the case. I ran 90++% of my training runs faster than the plan had set out. I have a goal, so why not make my training come as close to that goal as possible? 2. Start Slow to Finish Strong. Will someone PLEASE send me proof that this worked for you in a Marathon? I tend to start too fast, I know that I do this and I have been working on it. I have trained and know that I can can run slower pick it up at the end of a LONG run. But I am not convinced that I am ready to START SLOW?? What if I settle into the slower grove and can never find those precious seconds I could have gained with a more ambitious start? When I qualified for Boston last fall my main strategy was to focus on NOW. I think we tend, in a marathon, to worry about how we will keep it up for the miles ahead. I focused on how I felt NOW. Am I feeling strong? Yes. My strategy was to run as hard as I could while I felt good. I had a mantra to keep myself focused and to push pain and fatigue out of my mind. I pushed away thoughts of how I would keep up the pace and focused on how I felt right at the moment. And it worked..... Don't be afraid. Ask yourself what's the worst that can happen. You run out of steam, so what. Don't slow down in ANTICIPATION of running out of steam. Just run hard as long as you possibly can. I think I will take her advice. Go with my body. Trust my training and just RUN!! The rest will take care of itself. Do you train slower than your Goal time? How has that strategy worked out for you? 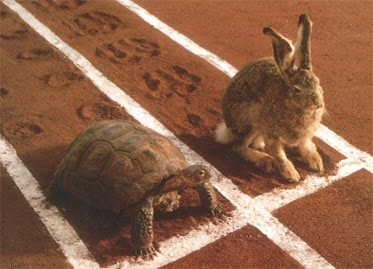 Are you a Tortoise or Hare at the start of a race? How has your pacing strategy played out good/bad/etc? Welcome new Tall Mom Bloggy Pack members!!! If you are new to Tall Mom here is your first chance to WIN a Giveaway. The WONDERFUL folks at Gone For a Run HERE are hosting this Giveaway. When I got an email from Gone for a Run I quickly clicked on the link, 45 minute later and a few "Honey Look at this!" prods to Muscle Man I was hooked! I HOPE he was paying attention since I LOVE Finish Line presents and Mother's Day is quickly approaching. 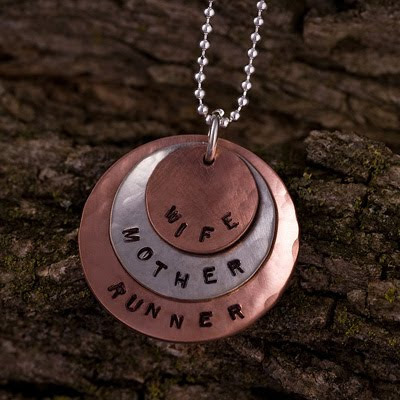 This site has everything a runner could want..
$25 Gift Card to shop at Gone for a Run you can purchase many many items for $25 on this website, the prices are great!! REQUIRED- Go to the Gone for a Run website HERE. Shop around, leave a comment to tell me which items you would like to buy. 1- Purchase something at Gone for a Run leave a comment to tell me what you bought. 2- In Honor of Earth Day do something Green. Pick up trash, purchase a reusable water bottle or coffee mug, turn off your lights early tonight, research ways to be more Eco-friendly and reduce your footprint. Leave a comment about what you did. 4- What is the BEST running advice you have ever received? Leave a comment sharing the advice and the context of when you inherited the knowledge. 5- Those who have donated to Marathon for the Cure and/or who are on the Tall Mom 1,000+++ Club get a free entry. Leave a comment if you want in, for the 1,000+++ post your current mileage. *****Giveaway Ends at 6:00AM and Winner will be announced shortly after on Friday April 30th. is to go beyond them." What are my limits? I have yet to pass out after a race or truly feel that I have given everything I had. Am I afraid to totally empty the tank? No!! But being new to running it is difficult to know when to really push it. My mantra is "Leave it on the Pavement," which was shaped from my basketball mantra "Leave it on the court." With just 11 days until Marathon Redemption I am thinking a lot about My Limits and I am BLESSED because I have an avenue to really test those limits..
What are your limits? Do you hold yourself back? Are you afraid to push because you may come up short? Do you like my new hat?? I did not get my usual 10am snack, so I ate it around 11:15 and snuck in a piece of licorice...DUMB!! When I set out on my run I got an immediate sideache. Oh well, I still had to get my workout in, on plan were 4 interval miles at 7:30-7:39 pace. **Weird things on the trail= moldy half block of cheese, lady running wearing a plastic hair cover, the word "Blessed" painted on the path, and countless black and yellow alive and squished caterpillars. **Thoughts= "I am glad I don't have to run this fast in a Marathon." and "But if I did have to run this fast to qualify for Boston I know I can." and "I wonder if I can hit a sub 8 minute mile the last mile of the Marathon?" and "Oh I hope that Marathon day is a good running day." 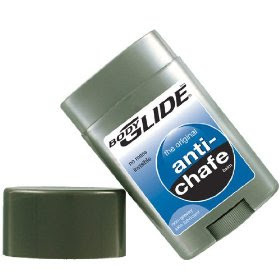 **Pains= The sideache went away at about mile 5 and was quickly replaced my left hip and knee pain... NOT FUN! I have not felt the hip pain before so I am going to take today off just to be safe. Guessing it is just Taper weirdness. **Finish Line= The railroad ties mark the end of my intervals. I can see the Finish for about 1/2 mile. I always imagine the race clock in Eugene. What is that last 1/2 mile going to feel like and what will the clock say??? TBD 11 days :) I have been visualizing the Finish, me dimples shining and feeling AWESOME! I keep that in my mind, because there are many many steps to take before I get there. It won't be easy!! I will not feel comfortable, but running for that FINISH LINE is awesome! I am PROUD that I ran through the pain. I did not give in to the negative thoughts in my head. There will be PAIN, I will want to slow, but I decide when to give up....and today was not that day. Limits?? What are they really but negative voices in our head? Self-imposed boxes holding us back from our potential. Every day you have a choice. Let the voices hold you back. Or RUN THROUGH and set new limits for yourself..
PS. Giveaway tomorrow....and I think you are REALLY going to like it. Click HERE if you want a preview.. 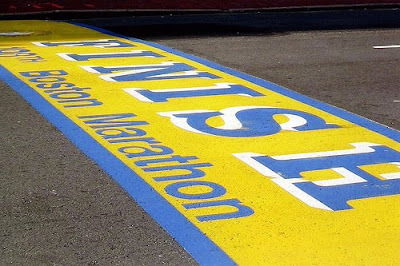 Question(s): Do you get excited about the Boston Marathon? Have you ever ran or do you hope to one day run in the race? Will you watch today and if so will it be watching in person, on TV, on the computer? Do you have anyone special running this year? Any great Boston stories to tell? 1. Do you get excited about the Boston Marathon? YES!! I have not been a runner long but I understand the EXCITEMENT about the BIG BIG events in our sport. When I hung up my Basketball shoes in college, ending my last season with a knee injury, I thought I would never have athletic goals to strive for again. Who am I without athletic goals? That question scared me and for a long time I felt lost without sports. I was SAVED years later by running. And to me the Boston Marathon is my re-commitment to fitness and athletic goals. I know I can get there! Now I just need to prove it. 2. Have you ever ran or do you hope to one day run in the race? No I have never run Boston. Yes I HOPE to qualify in less than 2 weeks at the Eugene Marathon and run in 2011 with Aron,and Lacey(??) And anyone else who qualifies, hello mecca for Bloggy meet-ups..
3. Will you watch today and if so will it be watching in person, on TV, on the computer? I am at work, but I will TRY to check in online. I was hoping to DVD the race but could not find it on our TV.. UGH!! Anyone know what channels will have the race on? I will use the tracker to check out my buddies and their progress. 4. Do you have anyone special running this year? I listed all my Bloggy peeps on Friday but here is the list. I am sure they are SWEATING and working it out right now.. HUGE HUGS AND HIGH FIVE! 5. Any great Boston stories to tell? I happened upon a show where a man ran Marathons while pushing his wife in her wheel chair. He qualified for and ran Boston a few times, struggling on the hills to keep the chair and his legs moving. It was inspiring!! Day 1 of the Moving sale was AWESOME!! We had people going through the stuff before we had signs up or everything ready. CRAZY!! We made $302 and had a steady stream of people all day. What I LOVED was selling my clothing for .50 to $5 and seeing the excitement on the ladies faces. I was on my feet all day and got some sun. We closed up around 3PM and ordered pizza. YUMMERS! I had to make a quick run to Target for running capris, diapers, etc.. When I got back I sat down, I knew I needed to run 8 miles. 1. You are tired should just sit and relax. 2. Ice Cream sounds way better than a run. 3. You can do it tomorrow. I sat for about 3 minutes, then got up and went. Sometimes the more I think about it the worse it gets. I told Muscle Man I would be back in less than and hour and a half and set out. - It takes my legs 2 miles to warm up. -I NEED to find comfortable shorts or capris to wear for Eugene. -Stop lights are ANNOYING!! People will STARE like you are an alien. -Hills make me SLOW, but going down feels GREAT! -I am ITCHY when I run!! My arms, head and legs itch. Wish I knew what to do about that. -Pizza is a pretty good source of pre-run fuel, I felt GREAT! -Spring= Scotch Broom, which I am allergic to.. ACHOO!! -The rain gently fell, which made me feel cool and refreshed. 8 Miles done!!! And the Runners high was PERFECT. Next up 16 miles on Sunday, 8 with Amanda who is 1 week from her FIRST MARATHON... Soooo excited to run with her before she leaves for OKC. MOVING SALE DAY!! How in the world did we accumulate this much STUFF.. No where near hoarder status but WOW!! I left my Tall Mom Calendar at work so I HOPE I don't forget anyone. Today I plan to get in an 8 miler after the sale, hopefully a short run tomorrow and 16 on Sunday, 8 with my buddy Amanda :) should be great weather for running. Please tell them Tall Mom Sent you..
***Will add more later. Gotta go sell some Stuff. 1. Today is my Friday because tomorrow is the start of the BIG MOVING SALE!! Yes folks our garage is packed with things we neither use or need, so we are going to try to make a buck, then donate the rest to the Goodwill. Much of what is in the garage is my bigger sizes and maternity clothes. BEAUTIFUL things that I love, but I hope I will never fit in again. 2. STRESS!!! Between work stuff, selling and buying a house, my hair is bound to grey prematurely. Yesterday I worked through lunch then had a unexpected change in meetings at the end of the day, so I laced up my running shoes and left the STRESS on the pavement. It felt sooooo good, like a weight lifted off. Running is my outlet for anxiety and frustration....I am truly blessed to have a way to get it out. It works people!!! 3. I LOVE BROOKS!!! The amazing folks at Brooks have hooked me up with my Eugene Marathon top, to be revealed soon :) The rest of the outfit is coming together SLOWLY....with 17 days to go I sure hope I can get it together :) What an AMAZING surprise in the mail yesterday... Can't wait to know what I will be sporting?? Go HERE and buy your own..
High Five Friday tomorrow.. Email or comment if you would like to be included!!! Feeling good, breezing past the walkers and feeling the WIND. I was running so fast my Garmin could barely keep up. The trail is close to power lines so I would look down and it would say 12:12 quickly followed by 6:45 pace. Darn Garmin gremlins!!! I was getting hot so I stripped off my long sleeve shirt mid run, wrapped it around my waist and re tucked my Ipod cord into my Sugoi tank. All while keeping pace, GOOD TRAINING!! I felt myself slow a little, my breathing was becoming labored and I was BORED on the trail. I realized that I needed to refocus, just then a slender male runner passed in a bright red visor. He was ZOOMING and gave me a nod, as if to say "Impressive pace!" LOL!! I took the look as a compliment and my pace increased. I know my plan only called for 5 x 1 mile "Aerobic capacity intervals" but once I realized that I could possibly break my 10K PR I sped up. How could I stop at 5 miles?? The last .2 seems to go FOREVER, there was a man just near where I knew I would be finishing. Looked at him, then to my watch, then to him.. FINALLY I made it and was ready to stop. He said "That watch was not going to tell you what you wanted was it?" Heheheh!! 10K= 45:37 (7:21 pace) New PR!!! YIPPEE!! Ran a cool down 1.8 miles (9:18 pace) to finish with 8 miles. I am totally happy with my speed today. I felt strong!! The wind tried to hold me back but I powered through. 18 days to Eugene Marathon!!! I am slightly addicted to the McMillan Running Calculator HERE. Have you ever tried this?? What you do is put in your time from a recent race and it will calculate what you can POTENTIALLY accomplish at all race distances up to the Marathon. Hear that legs?? Hear that Running Gods?? I CAN DO IT!!! COST: $5.00 tax deductible donation to Tall Mom Fundraising page HERE If you would like to give more please see Donation info HERE. Those who have donated $25 or more already get FREE entry into the race!!! Send Tall Mom an email with your name, Blog address (if applicable). Please let me know if you are running to dedicate to anyone. Chose your course, wear COOL gear, Pin on your bib (Coming soon) and RUN!! When you are done email Tall Mom the pictures, link to race report and your finish time. 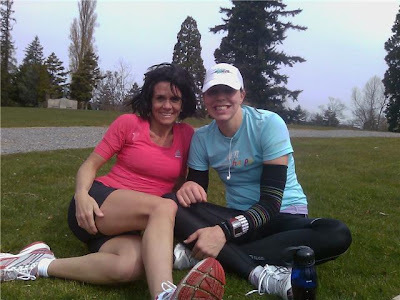 Every Racer will be linked/listed on Tall Mom blog. PS. If you can't enter today no worries. We live on one income and I understand how money can be tight. Entry to the Race will be accepted until 5/4. This will most likely be one of my first runs post Eugene Marathon....which will be GREAT!!! I know it is a Wednesday, but mid week races ROCK!! Cold day with WIND! We did 5 laps around a 5ish mile trail very hilly!! I arrived 5 minutes before the group set off and sprinted down to the restroom not a minute too soon. Yes I would start my 23++ miler with an upset tummy, YIPPEE!! I did not see Janna so I texted, she was late, everyone set out so I waited, and WAITED and WAITED... finally my wonderful runny buddy arrived. I am very glad I waited because I really needed her today, Janna played cheerleader and kept me going even when I was not feeling well. Here is a bullet point version of the FUN parts of the run. -Hills, and hills, thankfully we were running past the zoo, beautiful water views, lush Forrest's and where Muscle Man and I were married. We did the 4.7ish loop 3 times one way and twice the other way... FYI it is just as hilly both ways. -CRAZY characters, one man, Janna called Jose, who wore loose sweat pants under compression shorts WEIRD, a dude driving slow to check us out with and "I love s$x" sticker in his window, people steeling from our water stops I asked them for $1 and cut in front of them I PAID for this, etc..
-The funny part about a loop is you see the same people over and over and over. One tall man we saw first pushing a stroller with a woman running next to him, the next 2 times he was solo. I gave him a high five the last lap. -My legs felt like led and the wind was rough. Janna and I were using positive self talk to keep going. Things like "Wow am I glad that this hill is here," "The wind is really helping" and the one that got the most laugh when I said "Wow I feel so light on my feet today." -Janna busted ahead at the end and I coasted as best I could. I had a hard time getting down Gu and was running on FUMES.. Good news is that Eugene is pretty flat. With an overall 9:00 pace for 23.3 on all hills, I am CONFIDENT that I am ready. -I tested a pace band I cant wait to tell you all about. I am still LOST on my water, nutrition and clothing for race day.. UGH!! -TAPER....well not really I have a couple 8 milers this week. But the last long run preparing for Eugene is in the books and I am soooo PROUD!!! OK off to bed.. Up at 4:30AM because I have to work Sunday... Hmmmmm...thankfully I have black recovery socks to keep my legs alive. How did you runs and races go?? ****I will be announcing another Virtual Race for the Cure and Giveaway soon. Wow it was a LONG day....I worked 10++ hours on my feet a lot.. And I wore the wrong shoes.. and what did I get for my not-so-smartness?? Tiny toe blisters...oh goody!! Needless to say after a BUSY BUSY work week and very little training I am ready to ROCK my long run tomorrow. Can you say Stress Relief??? So I am going to give myself 30 minutes for this post then I am shutting down.. Soooooo sorry if I miss someone.. HIGH FIVE to everyone for sticking with me this week. High Five and welcome to the new Bloggy pack members!!! Heather- 5K trying for a PR!! 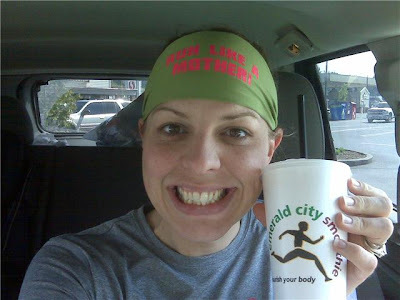 Amanda (close personal Tall Mom buddy and running partner) and her First 20 miler HERE. And she has a new header that I LOVE LOVE!! Hugs Amanda hope to give you a big pre-marathon hug before you leave for OKC. Tall Grandma for spoiling me with dinner, a tshirt and offering to let us take over her house when we are between homes later this month!! Love you Mom!!! NIGHTY NIGHT!! I know I missed some people....but it it 9:00PM and I need to hug my boys, eat a pb&j and get to BED!!! Thanks to everyone for the emails and comments!!! Today I have zero time to post as my Big Girl Job has me running all over the place. I hope to get in a BIG HIGH FIVE tonight!! Last night I had an amazing time with my Mom (Tall Grandma) and Sarah with "Run Like a Mother." Can't wait to tell you all about it and show you the photos. Even got to meet a local Blogger Chelsea which was GREAT!! Anyhow, off to my car to meetings.. I HOPE I can fit in my mid-day run today. If not I will be well rested for my 22-24 miler tomorrow..
Back tonight with HIGH FIVES!! OK already late and I have not even had my coffee... Have a WONDERUFL day folks!! 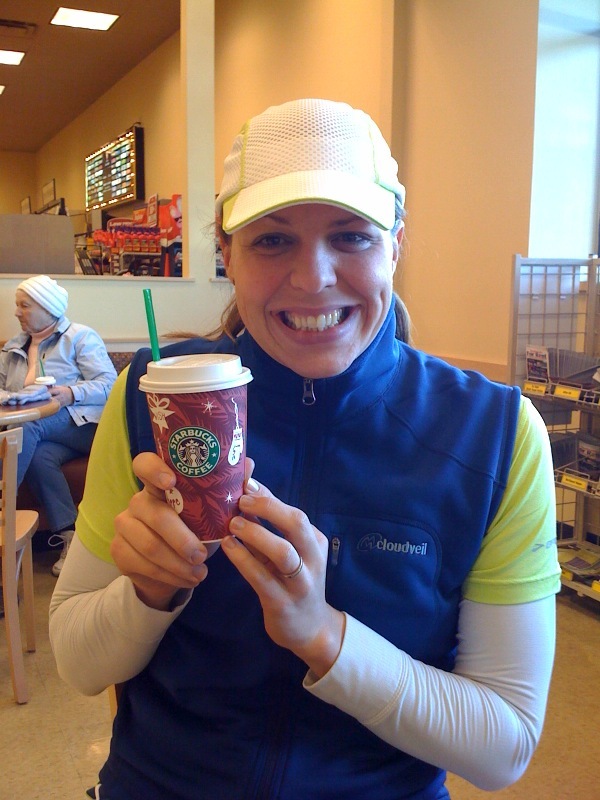 My first official day of Marathon training for Eugene was on 1/11 with my first Fleet Feet group run HERE. These last few months I have developed some FAVORITE things that have kept me moving and motivated. I have shared many of these things over the past few months but I wanted to post it ALL in one place. Lift Your Sole Jewelry HERE is quickly becoming my favorite. 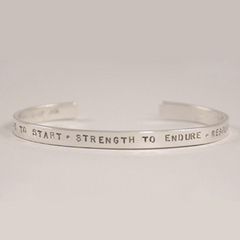 I will share more tomorrow, but this cuff I wear daily reminding me of the reason I run. I will either wear my Brooks Hat, Nike visor or a Bondiband (HERE). I will have all 3 options in my bag on long run and race day because what I wear is weather dependent. I am on the HUNT for a new hat and visor, suggestions welcome. 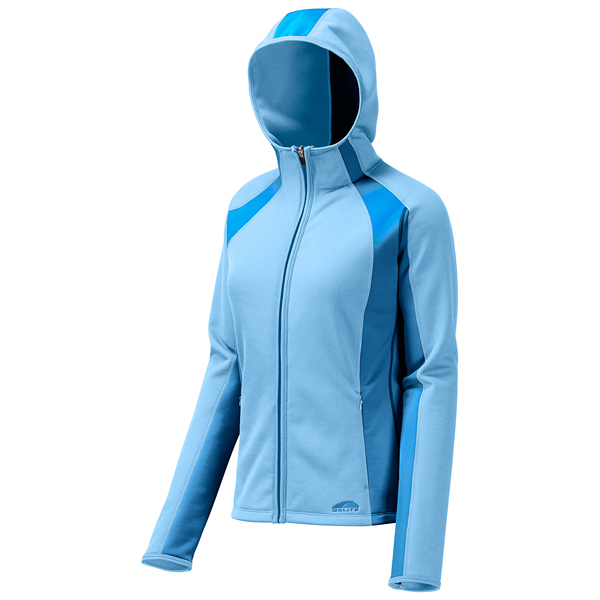 I have 3 favorite jackets Golite HERE, Patagonia and Brooks. A great running jacket for me will keep out the rain, have well-placed pockets and not make me too hot. 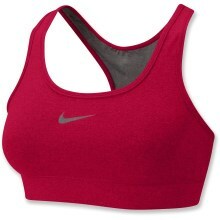 My all-time favorite bras are made by Nike and sold at Sports Authority and many many other store. I buy them on sale for $19 or less, I even found one at ross for $10. AWESOME! Brooks E-Z T's are the best running T-shirts. Long waisted and high quality. I have washed my 3 T's over and over and they look new. Plus there are some NEW and fun styles. Check it out HERE. I have raced many times in my bright orange "Happy Running" Brooks shirt. Sugoi HERE tank. I can't find this tank on the website?? But I am thinking this may be my race day top, well the pink one :) It is long waisted, a great fabric, tight, girly and comfortable. Sugoi Piston tights HERE are the BEST!!!! I have worn these tights for every long run this training cycle. Yes I may look a little like Cat Woman, but wow are these tights AMAZING! They hug my knees and the compression makes for a quick recovery. It might be a bit hot on race day to wear these?? But I might have to, these have become my running security blanket. There are piston shorts HERE... Hmmmmm??? 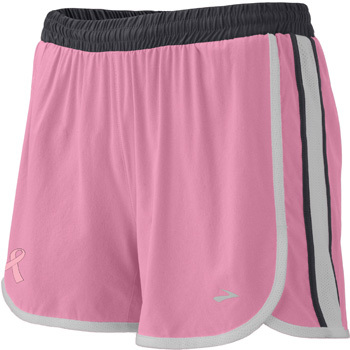 Brooks Epiphany shorts HERE, I have 4 pairs of these and wear them for runs shorter than 7 miles because I worry about my thighs rubbing. The fun colors and smart design make these a favorite! Garmin 305, yes is it huge and a brick, but the large screen and big buttons are ideal for training. I LOVE that I can run anywhere any know my distance and pace. This is a MUST HAVE for runners!! 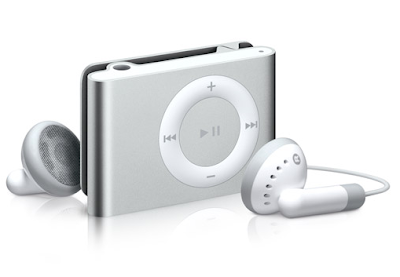 Ipod Shuffle, yes I have the 1st generation...LOL!! But this tiny Ipod clips on to my shirtm shorts, etc and hold enough songs for 4++ hours of entertainments. I have dropped it many times with not problem :) I wear one ear bud for safety, I still have not found ear buds that I love?? Golite Hydroclutch HERE handheld water bottle. 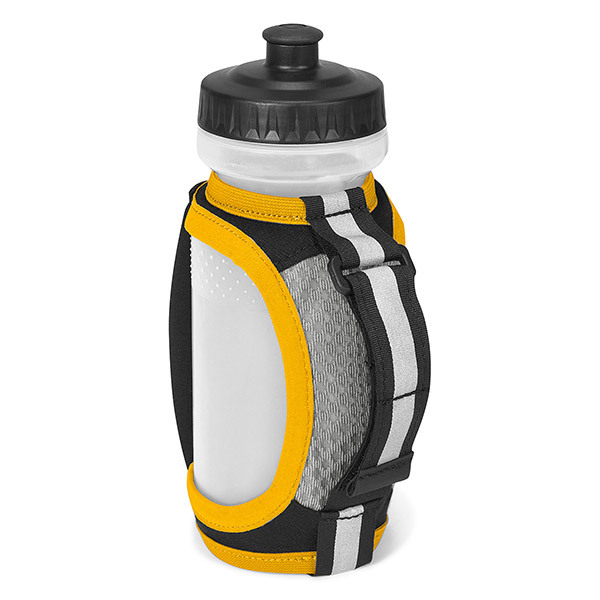 I have been training with a handheld this entire cycle and plan to have 2 bottles on race day. It is not too heavy and holds Gu's, Chomps etc. GREAT way to avoid the busy water stops and not slow down. 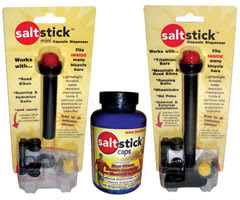 Salt Stick Caps HERE, I take one before I run and every hour or so on a long run. LOVE THEM!! I believe that salt balance helps with cramping. I have the stick holder but have not used it because I don't need more STUFF when I run. There you have it.. What will I wear on race day?? Very good question. Wish I knew. I am waiting for a few things to arrive in the mail. Then I will be letting my WONDERFUL Bloggy pack members help me decide. What are a few of your favorite things? Any products I should try?? Let me know..